Take notes. Write documents. Sketch ideas. You have handwritten notes to take, business memo to share, essay to write, have a story to tell, article to edit, lecture to record, whether it’s today’s journal entry, tomorrow’s thesis or a future bestseller novella. Notes Writer can help you create, edit and organize all your notes and documents in a single place. The way you like, wherever you are and totally paperless. 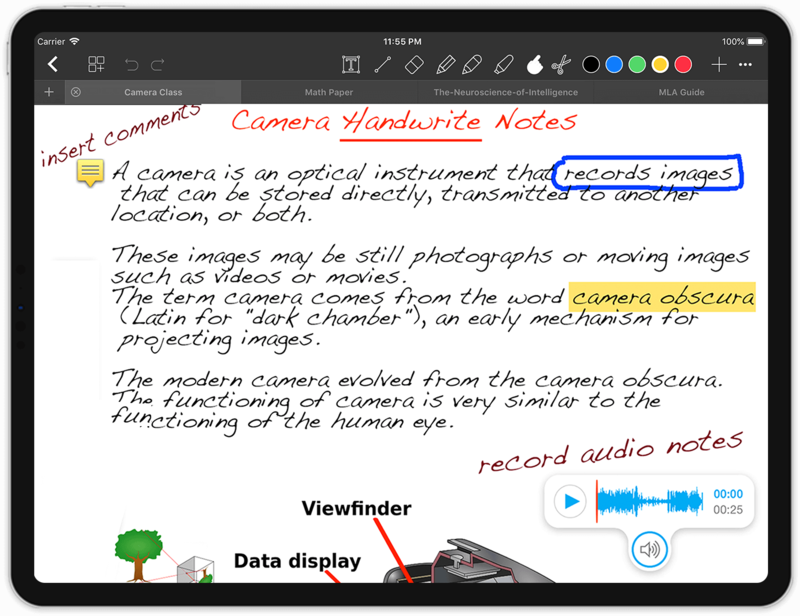 Capture your thoughts and words: Type, handwrite, annotate, sketch, scan & record notes the way you like and use Apple Pencil for superlative experience on the go. 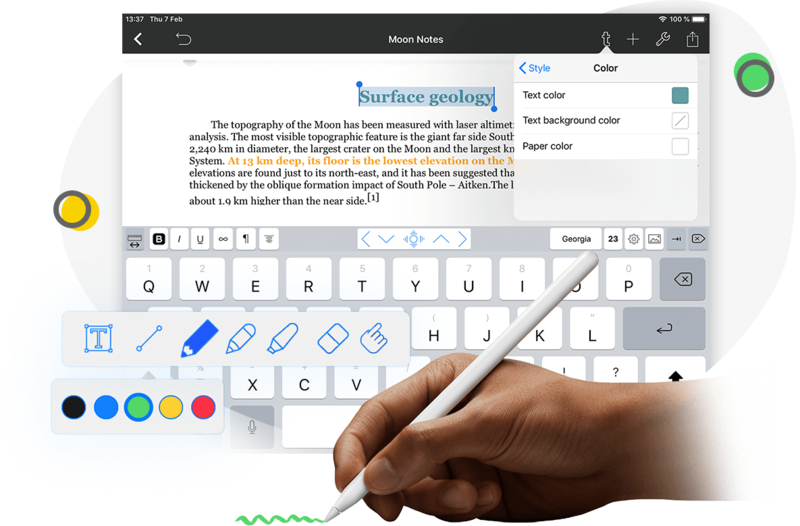 Use note-taking and writing tools to capture every word and idea. Stay organized at work, school and life. 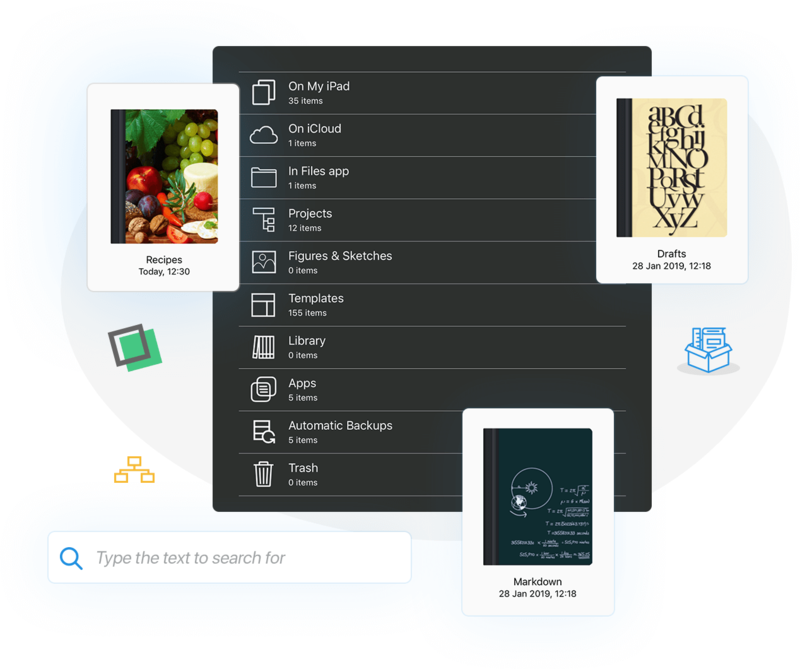 Organize your work in unlimited notebooks, folders and subfolders. Create notebooks and projects in your own tree-like structure: Sections, Departments, Classes, Lectures, Grades, Drafts, Chapters, Research, etc. 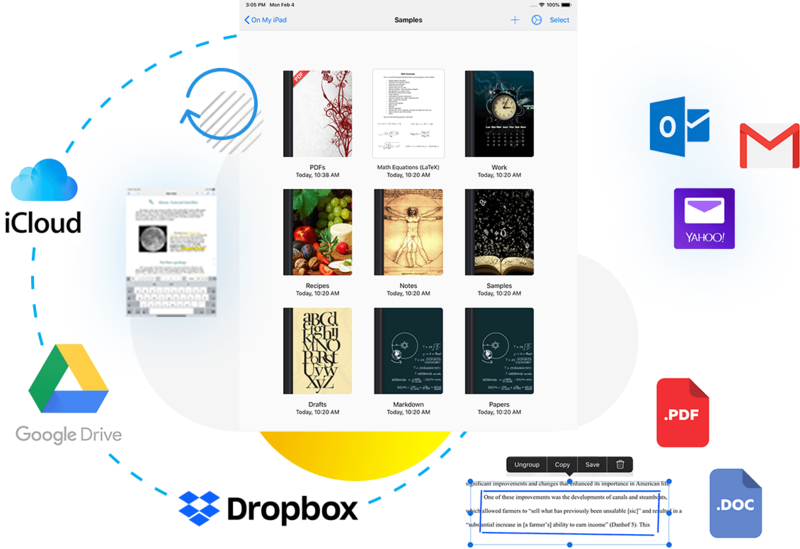 Sync and share seamlessly your notes, notebooks and projects across your devices and computers thanks to iCloud, AirDrop, Email Dropbox, Box and Google Drive. Export your stuff to different file formats. Take notes, sketch ideas and write texts as naturally as you do on paper but assisted by a wide range of ink and text tools, paper backgrounds and templates. Notes Writer allows me to quickly highlight text and images on the corresponding (password protected) document, and annotate it with commentaries and diagrams, and presents me with a multitude of editing options that I use to adjust and revise my notes after class. This app is literally like having several notebooks in my hand. And if I need another one I just create it.It finally allows me to use my iPad the way it should be used. Another plus is how quick the company was to answer a question I had, even on Sunday. I was struggling on deciding between Goodnotes and Notability. For the price, this app cannot be beat. It includes the best features you would find in either. The support team is also incredible. It would be nice if this program while in text mode could switch to writing mode to make corrections etc with this pen. If I could do that I would give it 5 stars. Over all a well done App. Best note taking app ever. Its kinda combination of goodnotes and Notability. Or even better.. Awesome! It is exactly what I wanted and much more! Thank you! I can honestly say this app is helping me go paperless! It's extremely helpful for pdf docs to annotate, organize, and store. I went from the free version to the pro...worth every dime! I love this app so much. Other friends recommended another app, however I chose this one because of it's features. I have no complains but the fact that my eraser is very laggy. I did not know what PDF/note modifier to get and simply landed on this one and pulled the trigger. It is very intuitive to utilize and versatile. Only issue after two weeks is that sometimes the keyboard won't appear when trying to type text. Have to close the app and completely reopen. Just started using Noter Writer Pro. It took me a minute to get oriented, but that is because it does so much. I asked a few questions via support email and received instant responses (on the weekend no less). I like it so far. 5 stars!